Come and explore the Central Australian Desert on a tour with us and spend an evening enjoying the magic of Uluru. Hear stories from the Anangu people and learn about the world’s oldest surviving culture. Then lay out in our billion star hotel and enjoy the beauty of the southern sky as we spend the evening camping out in swags under the stars. The adventure begins at the Cultural Centre with an introduction to the Aboriginal Dreamtime and its significance to the Anangu people. Then we head to Uluru for a guided walk to learn about the ancestral creation beings believed to have shaped the landscape we are immersed in. We drive on to bask in the beauty of Uluru’s colour changes at sunset and enjoy a classic Aussie bush dinner. The day finishes with an incredible view of the night sky as our stars and constellations emerge. We rise early from the comfort of our swags and leave the campsite heading for sunrise over Kata Tjuta. Breakfast is served as we watch first light peeking over the top of the domes. Finally as the sun lights the way, we go on a walk through deep and mysterious valleys. Here you will learn about our desert geology and the flora and fauna it contains. 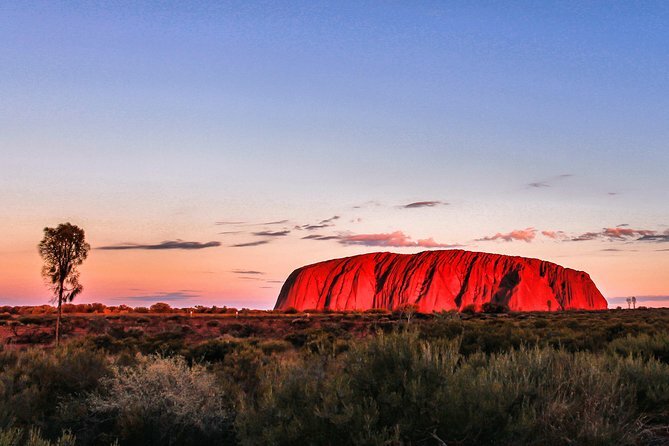 Then as a fully qualified "Rockstar" you will be able to tell everyone else about your experiences and the magic that is the Uluru/Kata Tjuta National Park.